Konghou (double-string harp) is an ancient Chinese harp. It went extinct sometime in the Ming Dynasty, but was revived in the 20th century. 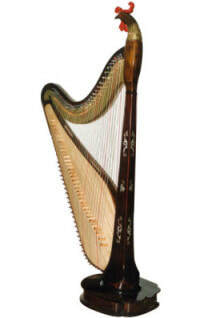 The main feature that distinguishes the modern konghou from the Western concert harp is that its strings are folded over to make two rows, which enables players to use advanced techniques such as vibrato and bending tones. 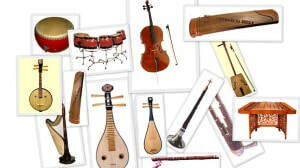 The modern instrument, however, does not resemble the ancient one. On each side of the sound box is a row of bridges over which 36 to 44 strings are stretched. Each string is supported by its own bridge. Thus the player is able to bend the strings to create beautiful vibrato effects. The tone quality is mellow and graceful.